Sgt. 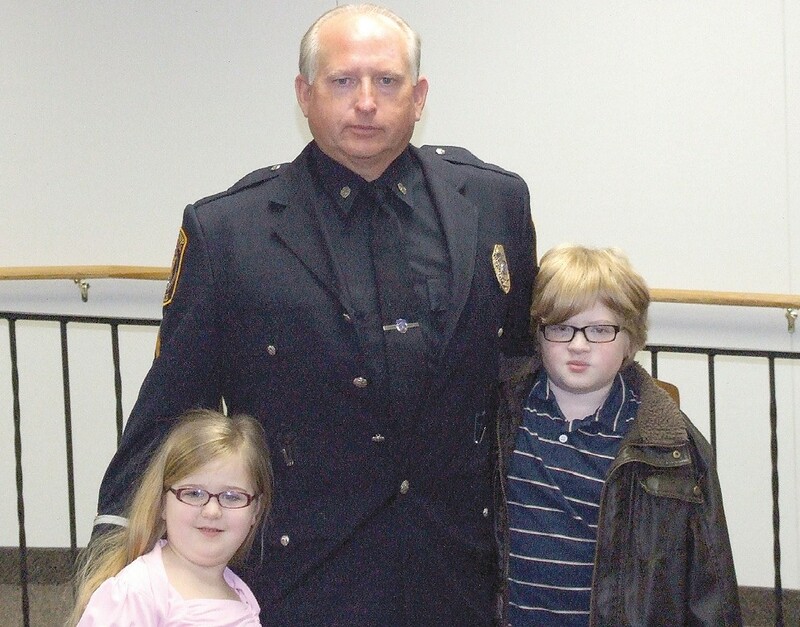 Randy Kimes of the Flint Township Police Department with his grandchildren following his proKIMES motion, April 16. FLINT TWP. — Ofc. Randy Kimes was sworn in as the newest police sergeant, following unanimous approval by the Board of Trustees at its Monday night meeting. Kimes name was submitted as the next candidate eligible for promotion by the Civil Service Commission. He was sworn in by Clerk Kim Courts and presented a new dress jacket bearing sergeant’s insignia. Several members of his family attended the brief swearing in ceremony followed by a cake and refreshments. Kimes joined the department in June 1988. He started his career in the Village of Otisville, and also worked for Genesee and Grand Blanc townships and as a Genesee County Park Ranger, said Police Chief George Sippert. He’s served as a police detective for the past 12 years and was instrumental in the capture of accused serial killer Elias Abuelazam in 2010 who is believed responsible for a Flint Township homicide on Miller Road. Hired in as a road patrol officer, Kimes steadily worked his way up the ladder. He has served as a field training officer and also worked with the anti-car theft unit. Kimes is a graduate of the Delta Regional Police Academy and holds an associate’s degree in criminal justice from Mott Community College and a bachelor’s degree from the University of Michigan – Flint. “Now he will have the opportunity that he has longed for to supervise and lead,’’ said Sippert, who had noted at previous board meetings that the police department needed to maintain a minimum level of experienced supervisors. Most than half of current patrol officers have less than 4 years experience, he said. Kimes promotion is a budgeted position following the retirement of a police sergeant last month.